Savage was in another home from which we adopted one of her puppies. We noticed when we chose our puppy that being the Momma dog, she was not in the best shape or condition. Having just given birth to 6 puppies she needed a lot of nutrients and attention which she was not getting from that owner. A few weeks after we took home one of her pups, we reached out to the previous owner and asked him if once all her litter was placed in homes could we adopt her. He gladly accepted our offer and we brought her home with us. She now lives with us and the last born of her 1st litter. She loves to be scratched. 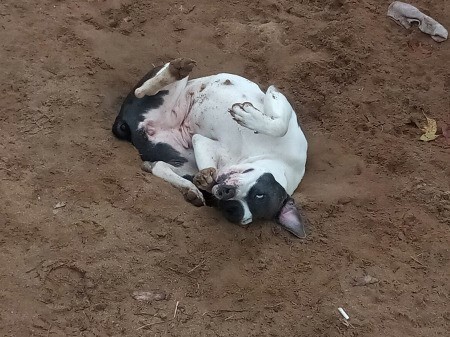 But since we are not going to constantly scratch her all the time, as she would like, her favorite past time is now rolling around in the sandy dirt. She just has her 2nd litter of pups that we have re-homed. She is back to being a puppy herself and is a big dog that thinks she is a lap dog.